As we continue through this school year, we are excited to observe the International Day of Peace! As stated in the first post of the new school year, we have been focusing on the concept of peace in each of our classrooms. This can come with challenges, as some of our friends are very young, however our teachers are very patient and loving as these concepts are established into our classrooms! Having inner and outer peace (being peaceful with others) is central to Maria Montessori’s vision of education. When one has peace within themselves, they are peaceful outwardly towards others. This is why we have peace areas and promote a calm atmosphere in our classrooms. It is important for children to learn to identify emotions that are felt and communicate them in an effective way. As our friends learn more about how to be peaceful with others, they exhibit traits such as grace and courtesy. Grace and courtesy go hand in hand, as they relate to how we treat others and our classroom. As these three traits are taught and demonstrated, the child will have better control of themselves, which sets a calm ambience around the classroom. After we finished the song, Ms. Megan, our lead Sunflowers teacher, read a book about how taking deep breaths helps us stay calm and peaceful inside. We talked about how being peaceful can change the world. 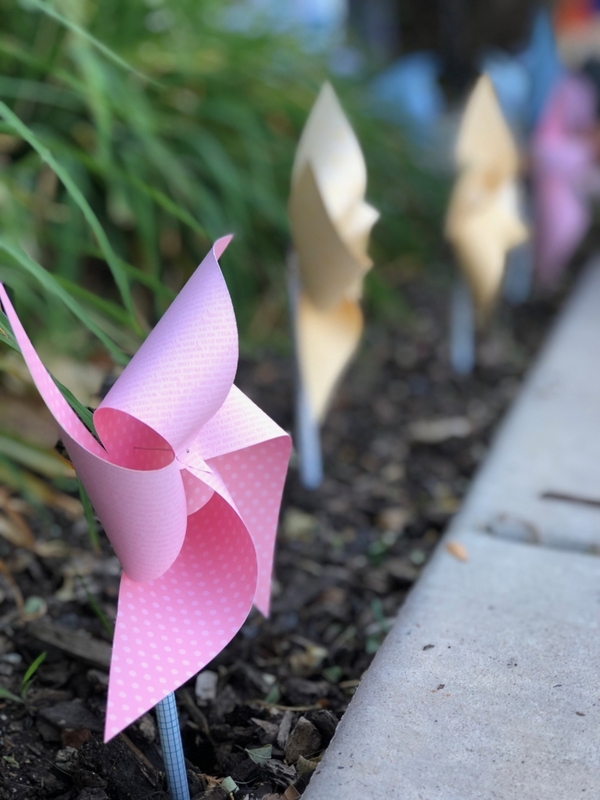 We then took our pinwheels outside and watched the wind spin them. Our friends were so excited to put them in the ground and watch them go. We hope everyone has had a wonderful International Peace Day and that peace can be found and accomplished throughout the world! Welcome to the Daisies' Class!